The surplus in the U.S. presents a starkly contrasting picture. Again, we modeled labor supply and demand using the same two sets of assumptions: GDP and productivity growth rates for the past 10 and 20 years. 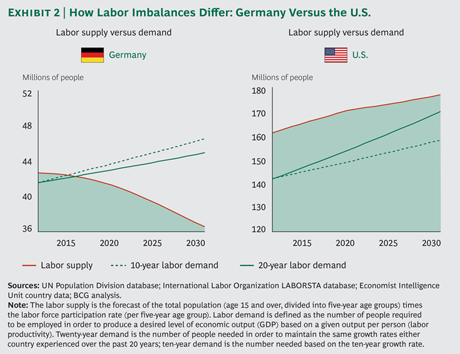 In each scenario, the supply of labor in 2030 will exceed demand. In the best case (the 20-year demand scenario), supply will exceed demand by at least 7.4 million people. Of the six unemployment measures used by the U.S. Department of Labor, the one commonly reported in the press is U-3. The broadest unemployment measure(U-6) has hovered around 14 percent since late 2012 and mid-2013, versus the 8 percent rate that is generally reported. There's an obvious and huge mismatch in what the economy needs, and what our education systems are training people to do. Meanwhile, politicians juke the stats, and the mainstream US media makes like the US labor force and economy is doing just fine.